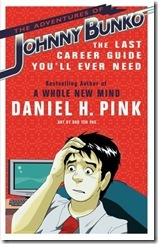 Dan Pink has released his latest career book, Johnny Bunko: The Last Career Guide You’ll Ever Need, it’s a manga book with all of that advice you wish someone had given you. Over a bourbon last night, Eli Singer and I were reflecting on manga, well Scott Pilgrim, and career paths. I was saying that I never imagined that I would be and “Evangelist”, this honestly wasn’t on my career career path at any point. It feels like a “career choice based on fundamental reasons”, something that I thought would be inherently valuable regardless of what it may lead to. Garr Reynolds of Presentation Zen provides a beautiful summary of Johnny Bunko. The slides have only text or photographs from istockphoto.com. It’s 6 simple lessons about building a successful career that all students should take the time to read. Dan Roam‘s new book The Back of the Napkin: Solving Problems and Selling Ideas with Pictures has a great set of techniques and tools for those of you who can’t draw. The VizThink community is a group of visual thinks to share their philosophies, experiences and approaches for using visualization for learning and communication. (VizThink has hired Ryan Coleman as their Chief Community Evangelist. And we’re back to the career discussion, I wonder if Evangelist was on Ryan’s path). If “The MFA is the New MBA“, then the visualization and communication tools presented are the foundations for the next generation of leaders and CEOs. And your career path might not have included becoming a designer, but there is obviously some market exchanges that can happen when, a picture is worth a thousand words.